PuzzleMad: A bonus for me - and so for you too! A bonus for me - and so for you too! I've been trying to keep my blog posting to just one a week so as not to overload you all. But today I received a nice little packet from Allard after his return from the IPP in Japan. It would appear that he had a great time and his exchange puzzle was well received. I know I am eagerly awaiting his and Rox's reviews of the exchange puzzles? This packet contained 2 wonderful goodies: Jerry's Ball in Cylinder II and Allard's own Magic suitcase puzzles. 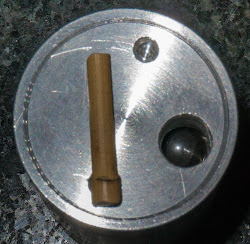 A few days before the IPP was held, I received an email from Jerry Loo informing me that he had version 2 of his ball in cylinder finished and would appreciate my opinion of it. To save on postage across the world he proposed giving it to Allard who he would be meeting at the IPP so Allard could bring it back in his luggage. After a short humorous exchange about luggage allowance during which it would appear that either he had paid for many Kg of extra weight or, more likely, he had forgone any change of clothing and just taken empty suitcases! Can anyone report on how Allard smelled after several days of puzzling? I was expecting to just pick up the Ball in Cylinder at the next MPP (unfortunately for me it will have to be the next but one) and was surprised and pleased when Mrs S grumpily informed me that I had received yet another package! Please note I was not pleased that she was grumpy - I was pleased at receiving yet another package! Tearing it open, my delight increased even further to see that Allard had included his exchange puzzle too! So far I have only spent about 30 minutes with the ball in cylinder - my initial thoughts are that this one is better finished than the last one with 2 pairs of decorative lines around it. It also comes with a small rubber tipped stick which would appear to be needed to hold something steady. 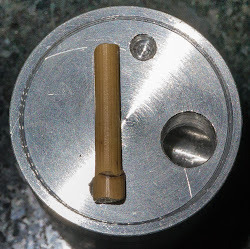 There is a large ball bearing that quickly slides in and out of sight in the exit but like the previous version the ball will not exit the hole. 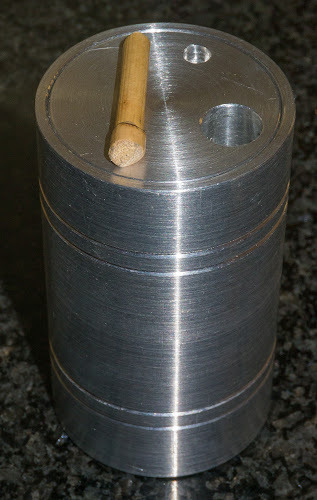 Holding the large ball immobile with the little stick and swirling the puzzle around reveals that there is another bearing inside and some kind of internal maze. Now obviously, it is important to retrieve the other ball and presumably use the stick to hold the large ball out of the way. My early attempts so far have been completely unsuccessful. I think this one is considerably tougher to solve than the last one and I look forward to exploring further - it is going to require quite a bit of thought. At the moment I am not sure whether I will be able to solve it! But I'll keep you all informed of my progress. I am sure that this beautiful and challenging design will be available from Jerry shortly and you should all run out and buy it immediately! Next up is this gorgeous black suitcase! You wouldn't believe how difficult it is to photograph these on a black marble worktop! I have solved this before when Allard handed a copy around at the last MPP. It was jointly designed by him and another great puzzling friend from Holland, Louis Coolen. Apart from Wil Strijbos, I think that Louis is the greatest puzzle solving machine I have ever met! Almost nothing beats him apart from my Yak puzzle which he singularly failed at! I intend to remind him of that at every opportunity! "open the case with a little magic, then use the contents to make something magical appear"
Obviously magic is the theme. 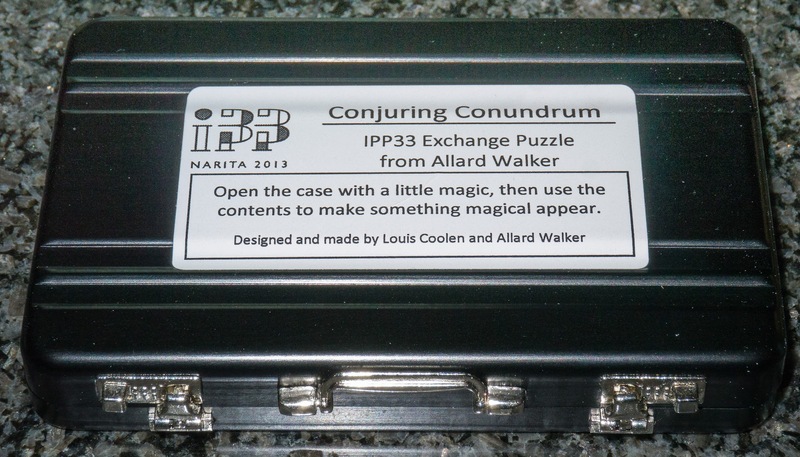 This fits with Allard's general approach to many puzzles - many times when I have wondered aloud how a puzzle works he has shouted out, very helpfully, "Pixies"! Thanks Allard, that's always appreciated! Only opens this much! Anything useful inside? 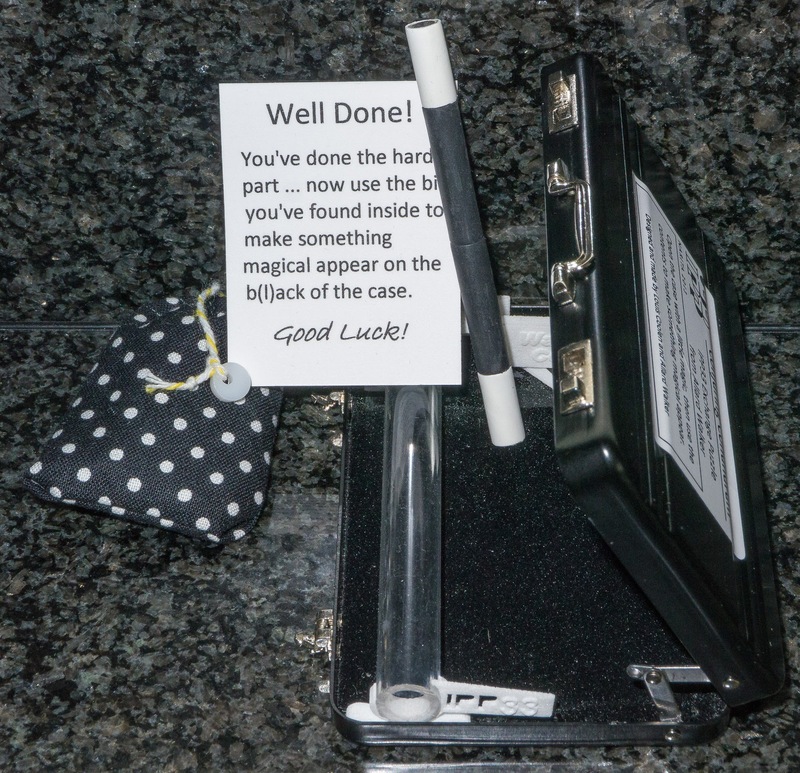 The latches work perfectly and the suitcases only opens a few degrees, revealing the word magic and a conjuror's wand in a plastic tube. The wand can be removed and anyone who attempts to wave it over the case and utter the word Abracadabra should be taken outside and shot by the leaders of the IPP committee! Investigating the wand reveals something interesting and then STOP! THINK! Use what you know and within a few seconds you have opened the case. Got it open using magic - of course I'm not going to show you the mechanism! Now you have an open case, a little bag and a message that you've done the hard part! 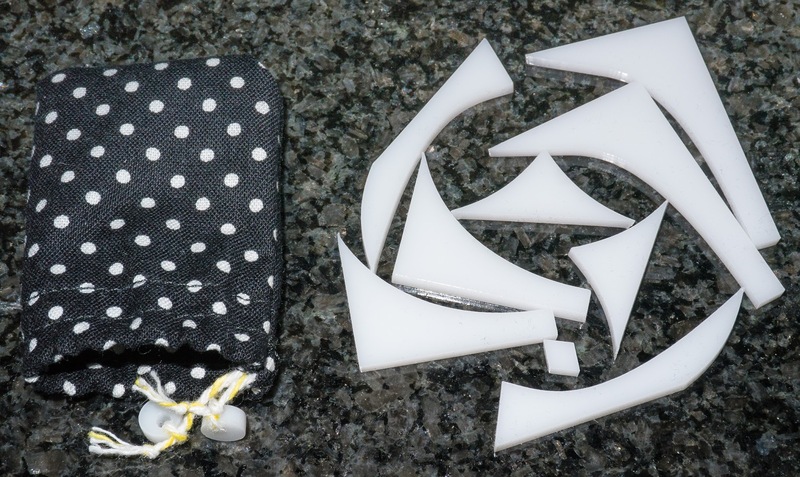 The next part is to make something magical with the bits of white acrylic that are in the bag. Now I am terrible at packing puzzle and shape making puzzles - guess what this is? At the MPP, I sort of made the correct shape but not quite right and eventually Allard had to show me the right arrangement. It's really clever, but I'd expect no less from such an imaginative pair of puzzling geniuses. To my eternal shame after 1/2 hour of trying again, despite knowing what it's supposed to be, I still can't reproduce what he showed me! But then I'm only a rank amateur compared to them - plus I'm really not very bright! I am sure that if you contact Allard, he will have a few copies available for sale for you. Thanks Allard, Louis and Jerry for making my day! I have had a very pleasant time playing with two totally unique puzzles and have not actually managed yet to completely solve any of them! Kevin, thanks for your initial post on the Ball In Cylinder No 2. Just to let you know, the wooden stick plays no part in the solving of the puzzle. I stuck it inside the hole to prevent the ball bearing from rattling during transit. I should have included a note to inform you of this but due to all the rush with IPP33, I forgot. I should have guessed! I'm an idiot! I just thought that having gone to the effort of making a rubber tipped stick it would need to be used! I have been enjoying "Conjuring Conundrum" and have finally solved both parts. Well done, Louis & Allard!! I still can't remember how to do the final bit! You thought Ball in Cylinder 1 was easy? I couldn't figure it out at all! #2 has me very scared! It's frightening me just now! 200 posts - I have been VERY bad! Eric Fuller! You are N times a genius!